HD Radio-equipped systems can receive music and other information, such as album art, song titles and traffic updates. HD Radio technology is in 22.5 million cars on the road. • HD Radio receivers are included as standard equipment in Mercedes-Benz, Scion, Mini, Volvo, BMW, Rolls-Royce, Bentley and Tesla vehicles. • In 2014, nearly 40% of new cars sold in the U.S. were equipped with HD Radio receivers. • More than 2,000 stations nationwide use HD Radio technology. Source: iBiquity Digital Corp.
With so many listening choices in modern cars, from satellite radio to streaming services such as Pandora and Spotify, one might imagine that the era of AM/FM radio is coming to an end. But it isn't. Radio has proved incredibly resilient, as a study released this month by media tracking company Nielsen shows. And the auto industry has taken notice, investing in a transition to digital radio, even as CD players disappear from the dash. This year in the U.S., about half of new cars sold will be outfitted with a service called HD Radio, which offers a crisper signal and thousands of extra stations. The service was developed by iBiquity Digital Corp. of Columbia, Md., which won an endorsement from the Federal Communications Commission in 2002 to start a switch from analog to digital broadcasting. "If anything, I think radio is becoming more entrenched -- not less," said Robert Struble, CEO of iBiquity, which licenses the HD Radio software to infotainment suppliers such as Fujitsu Ten, Clarion and Harman. More than 90 percent of Americans listen to radio at least once a week, according to the report by Nielsen, which advises broadcasters and media buyers on advertising rates. That is down just a few percentage points from before the rise of digital music, said Jon Miller, vice president of audience insights at Nielsen. Nielsen cannot easily compare its AM/FM radio numbers to the dozens of Internet streaming services, let alone downloaded music that's being played over a Bluetooth connection. So it's possible AM/FM radio is losing market share, Miller said, but the pie is growing: People seem to be listening to more content than ever. "Radio's great strength has always been in the car," he said. "That's still true, even with more and more options." HD Radio works the same as analog AM/FM radio, except that the signal is digitally compressed before being transmitted and is decoded by a receiver in the car. Stations that broadcast in HD can include other information with the music, such as album art, song titles and traffic updates. There are now 2,200 stations broadcasting in HD in the U.S. and another 1,500 digital-only stations. A driver can push a button to find multiple stations at the same frequency. In Los Angeles, for instance, the iconic rock 'n' roll station KROQ broadcasts a second channel, KROQ HD2, with hits from the 1980s. But no one thinks radio ever will return to its past dashboard dominance. As cars are sold with dedicated Internet connections and smartphone interfaces such as Apple's CarPlay and Google's Android Auto, drivers have too many options for that. "The days when analog radio had a monopoly on the car are long gone," Struble said. In the years ahead, he added, "every car will come loaded with digital radio, satellite radio and a variety of Internet and streaming services. And every car will have a hard drive. That's just going to be the competitive landscape." IBiquity, which holds 150 patents around HD Radio, generally loads its software onto a stand-alone chip from Texas Instruments or NXP Semiconductors. Texas Instruments also offers the software preloaded onto its Jacinto infotainment processor. The total cost is $5 to $25 per car, Struble said, down from roughly $100 in 2005. In 2005, BMW announced it would be the first company to offer HD Radio in a production car. It is now standard equipment for brands including BMW, Mercedes-Benz, Volvo and Scion. HD Radio was a natural fit for Scion, which updates its standard infotainment system every two years or so, said Korey Tsuno, a manager who oversees audio equipment and makes sure Scion's cars play nice with aftermarket stereos. Scion found HD Radio an inexpensive and simple way to make listening more pleasant without making customers fumble with a smartphone. 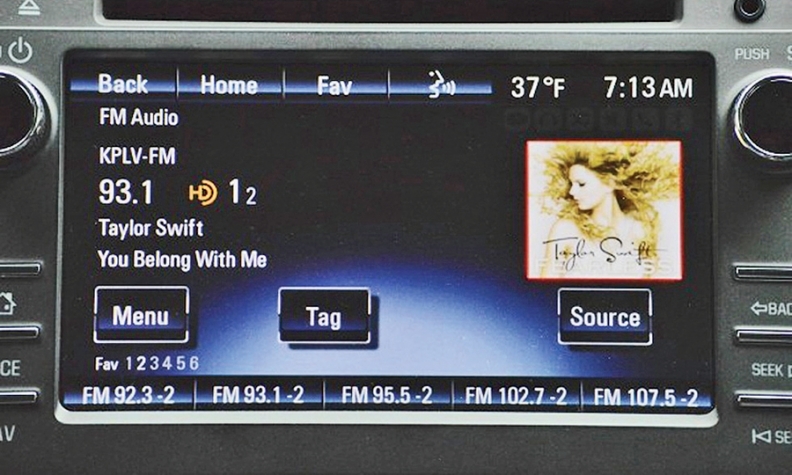 Added to Scion's infotainment system in 2011, HD Radio has stayed there through two updates. A new system, with a 7.1-inch touch screen, makes its debut in the FR-S coupe this summer. "With radio," Tsuno said, "you get in your car, and it's on."